Rodney Jenkins dominated the American show ring in the 1960s, ‘70s and through most of the 80s before retiring as the most successful rider in the history of U.S. show jumping. 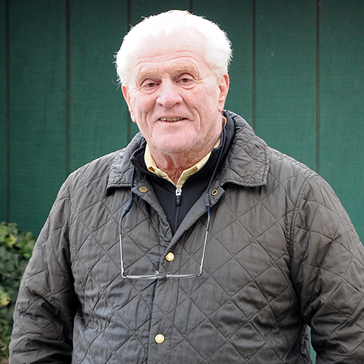 He was inducted into the show jumping Hall of Fame in 1999. Jenkins was a member of 16 Nations’ Cup teams from 1973-1987, winning ten world championships for Team USA. Before riding show horses, Jenkins was a leading rider in the Hunter Ring, particularly in the 1960s, before riding jumpers became popular. Jenkins is from a famous Virginia family of horsemen-huntsmen and credits his father for much of his success. Since the switch to training thoroughbreds in 1991, Jenkins has been one of the most successful trainers in the mid-Atlantic, winning with over 20% of his starters and saddling over 25 stakes winners, including Centennial’s Rebel Yeller. Jenkins has a long relationship with both Dr. Stephen Carr and Paula Parsons. He is based on the Maryland circuit, which is beneficial because of the close proximity to Middleburg, Virginia, the Centennial base of horse operations.